Reduce means to cut back on the amount of trash we generate. Reuse means to find new ways to use things that otherwise would have been thrown out. Recycle means to turn something old and useless (like plastic milk jugs) into something new and useful (like picnic benches, playground equipment and recycling bins). Pack your lunch in a lunchbox. Paper and plastic bags create a huge amount of waste — and plastic bags take hundreds of years to decompose. Try a durable lunchbox or reusable lunch bag instead. Ditto for what goes inside your lunchbox. Instead of plastic baggies, try reusable containers. Bring reusable bags to the grocery store. Most stores sell canvas or durable plastic shopping bags that can be used again and again. Some grocery stores even give you a little money off at the checkstand when you BYOB — bring your own bags. Say no to bottled water. Instead of buying bottled water, use a reusable water bottle. Watch what you buy. When you’re in the supermarket, pay attention to the packaging. Can the container be cleaned out and used for something else? And when comparing two similar products, if one has less packaging, consider making that your selection. Clean out your closet. Maybe your size has changed. Maybe your tastes have changed. Instead of throwing away clothes you don’t want anymore, give them to someone who will want them. If you have a box of toddler clothes, for example, and your “baby” is now in grade school, give the clothes to a friend with a young child. You can also donate your clothes to any number of charitable organizations — they give your clothes a good home, you get a nice tax deduction. Share your toys. Do you have a bunch of old toys you don’t need anymore? Donate them to a local daycare provider, preschool or family with kids. You can also donate them to local charity. The more you share, the less you waste. Find a new use for an old item. When it’s time to throw something out, think about other possible ways to use it. Glass jars, for example, can become storage for your crafting area or shop. Old bath towels can be cut up and used as wash rags. Plastic pop bottles take on a new life as bird feeders. Make a woven basket or tray out of old magazines. And the toothbrush you’re replacing is the perfect scrub brush for hard-to-reach areas. Have a garage sale. You know that dining room set, exercise equipment, knick-knacks, blender and other things around the house you no longer use? There’s someone out there who would love to have them. A garage sale is a great way to clean out your space and help reuse all the items you don’t want. You can make a little money too. And when the sale is done, box up anything that didn’t sell and donate what’s left to a local charity — many of them will come to your house to make a pickup. 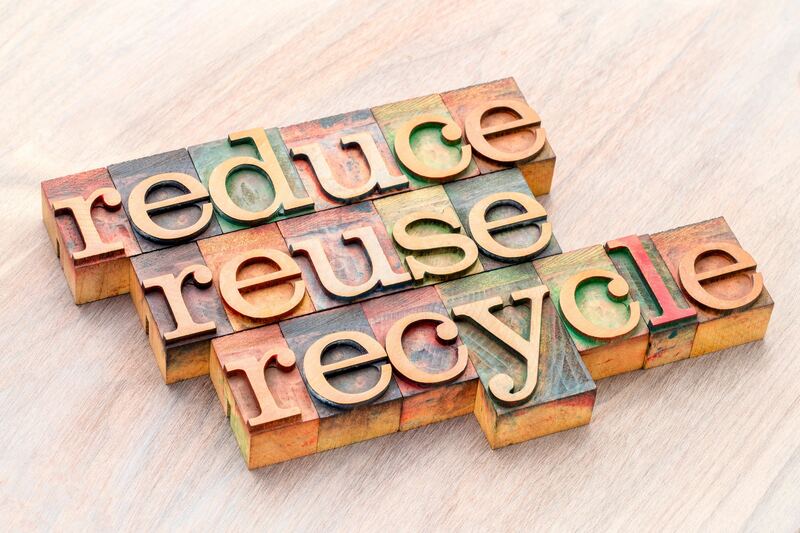 Recycling is the last — and most commonly used — of the 3 Rs. Recycling is changing discarded materials into new products in order to avoid using more virgin resources. Corrugated cardboard, milk jug style containers, newspaper and inserts, and tin and aluminum cans can all go in your Rogue Disposal & Recycling red-lid cart to be recycled. But what happens to those items down the road? Corrugated cardboard is recycled into paper bags, paperboard (like boxes for detergent, cereal, tissue and shoes), new cardboard and even the squiggly middle part of corrugated cardboard. The plastic in milk jug style containers is turned into plastic lumber for decking, buckets, Frisbees, storage tubs, new plastic bottles — and stadium seats! Newspaper is one of the easiest-to-recycle and most-recycled materials. Yesterday’s news gets turned into egg cartons, building insulation, paper plates, kitty litter, construction paper, phone books, sheetrock and new newspaper. And when you put tin and aluminum cans in the recycling cart, they are taken to a plant where they can be reprocessed into a variety of new products — keeping them out of the landfill and continuing their useful life. Old cans might become new cans, or they may be changed into things like bike frames or asphalt roadway.